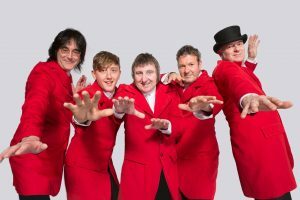 Kinks Tribute band The Kinks Experience is one of the UK's top tributes. This band recaptures perfectly the energy and subtle sounds of The Kinks. Playing authentic guitars, keys and amps to carefully keep the sound vintage, the band have worked hard on all the original arrangements of the songs- and they are all there in a set list full of hits from You Really got Me, All Day and All of the Night, Dead End Street to Waterloo Sunset and Lola. The Kinks are one of the most important and influential bands of all time. With a rich and diverse range of song writing from Ray Davies and his brother Dave, the band set a standard throughout the 60’s 70’s and 80's with hard edged rock 'n' roll, outstanding melodies and razor- sharp lyrics. The Kinks Experience is dedicated to recreating the unique sound of the Kinks. Made up of experienced musicians from bands previously promoting original material, they formed in June of 2015 at Berkeley 2 rehearsal studios in Glasgow. Founder members are bass player and life-long Kinks fan Alan Drover, ex Skelter and guitarist Peter McClurg, ex The Rhymes and Skelter. Together they had considered the idea of forming a Kinks tribute band for many years. But the right line-up was proving hard to find The main challenge was finding a Ray Davies. Then Peter met Rikki McKay ex- Blackberry Jack and Kinks fan and a plan was hatched to rehearse 3 songs at Berkeley Studios. That first rehearsal was so successful and the chemistry so explosive that the band were playing their debut sell-out show in Ayr that August as The Kinks Experience. Drummer Tommy Clark The Seventh Sons & The Standards with keyboard player Arnie Burgoyne -former Echo and the Bunnymen- completing the line-up. The band has gone on to become one of the most musically and visually accurate Kinks tribute acts in the UK playing to great reviews at venues like the Ferry Glasgow, The Cavern, Liverpool, Irvine Arts Centre, Bangor Mod Weekend and Oran Mor Glasgow to name just a few. The Kinks Experience is available for Pubs, Clubs, Festivals, Corporate Events, Universities and weddings.